Lines are traced and followed, made and extended, grooved and lived. I’m concerned with the lines of the pilgrim path. 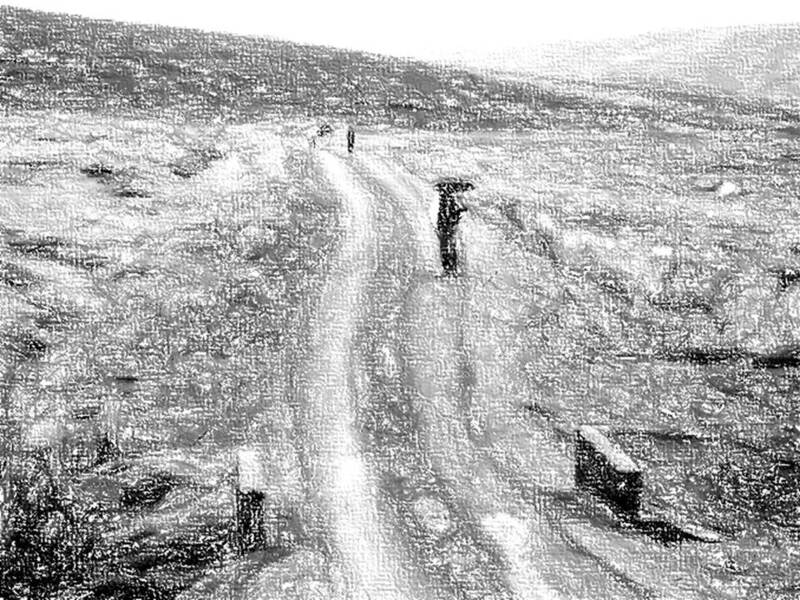 Using the ‘Pencil Sketch’ function on MS Powerpoint I altered some fieldwork photos taken while walking Tóchar Phádraig as part of different groups over the past few years as a way of exploring the role of lines. Starting with the literal lines of the images rendered as drawings, I wish to explore the others lines and meanings present. 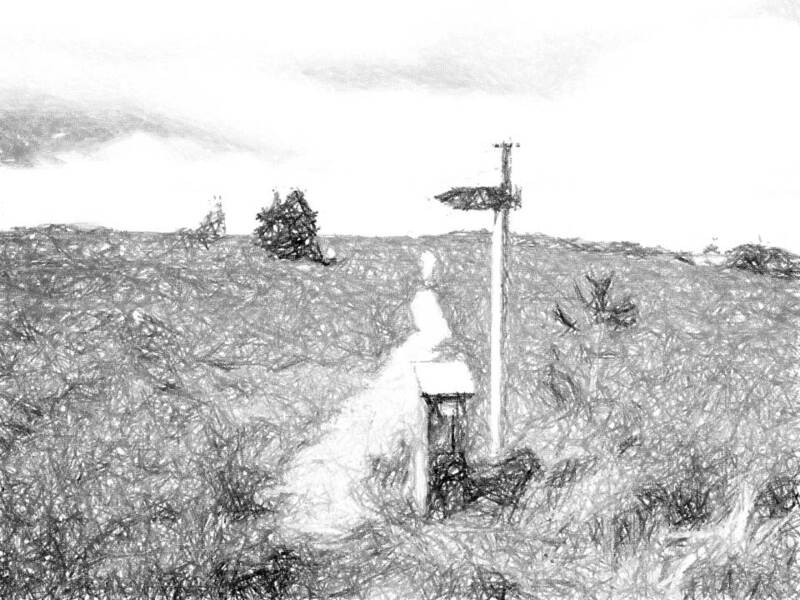 Robert Stoddard, in his 1987 article Pilgrimages Along Sacred Paths, explored the geography of sacred space as points, lines, or areas, with the lines category referring to the routes of travel of activities associated with religious motives. This classification draws attention to the line itself, that is the pilgrim path in this cases, as having significance, rather than being a mere route to a sacred site (spot). Elsewhere, the anthropologist Tim Ingold, in his book Lines: A Brief History, explores the potential of the line as movement, through the concept of wayfaring. The line is a pathway, it is movement, it is the means through a person engages with the surrounding environment. Through a few (geo) poetic stanzas I trace some thoughts on lines in this pilgrimage. I wonder where they will lead? 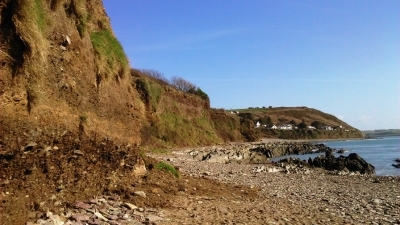 A Sunday morning walk in Myrtleville, Co. Cork. 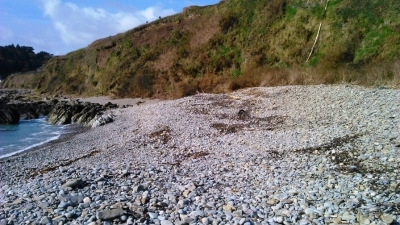 Although my knowledge of physical geography is rather basic, I was taken in by the features of my coastal walk, which were shaped by the forces of the sea and weather meeting the rock and land. The toll of the numerous winter storms were evident even on this calm, bring Spring morning. The patterns of the deposited worn rocks, in successive shelves, crafted by the waves were especially impressive, as I walked along one such shelf about 1.5m above the waves breaking with a further shelf rising c.1m further up again. The pleasant waves appear a little off shore before coming in to meet the exposed rock, with slight splashes made. It is at this place, in these actions, that the sea and land meet. The back and forth of the waves creating a liminal layer between these two worlds. Recorded using my phone and the Soundcloud App, I capture some of the ambient waves followed by my own treading across two of the beach surfaces. The audio of my walking captures the interactions of my feet on the stones, with my prescence being felt in the very action of each impact. With only the sound as the evidence of this process, the beach and I have equal roles in creating these moments. When the feet are mid-stride, in air, they are absent, it is only when the surface and I come into to contact that we are made present, made be. “As you ‘walk the Tóchar’, whether on foot or in fantasy, you will be going not only on a spiritual pilgrimage, but on a cultural and historical journey down through the ages also. And both experiences, if fully entered into, should bring about that change of heart and insight of mind which is essential to a pilgrim’s progress.” (p.v) Fr Frank Fahey in Tóchar Phádraig: a Pilgrim’s Progress. Tóchar Pádraig is a walkway that leads from Ballintubber Abbey to Croagh Patrick. 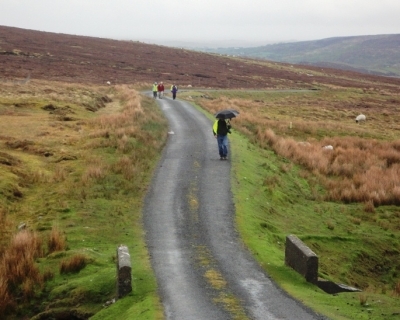 This old pilgrim road stretches c.35 km across mid-Mayo on a route that is both cross-country and on quite rural roads. 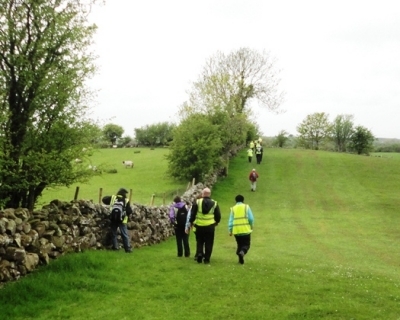 Annually, Ballintubber Abbey organises four group walks during the summer months. This account is taken from one such event. 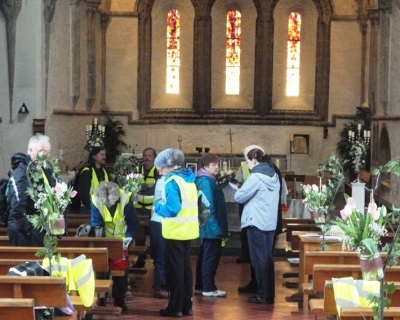 Pilgrims gathering in the morning in Ballintubber Abbey. Mixing and preparing for the pilgrimage ahead. The gathering in the Abbey is a starting point where Fr Frank Fahey gives an introduction to the route and the concept of pilgrimage. Although some people arrive in the groups – in my case, my father accompanied me – most people don’t know each other. During the day people, through chat and travelling together, will get to know each other better, leading to the emergence of a camaraderie or communitas. My research was a nice topic of conversation which I shared with different people throughout the day. 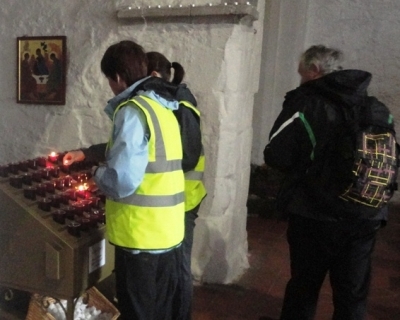 Pilgrims are invited to light candles before they begin walking. It serves as a means of connect with an intention and the Divine. A tóchar is an historical route way which served an important land-based transport systems in ancient and medieval times. They were particularly associated with pilgrimages and ecclesiastical foundations. It is speculated that Tóchar Phádraig is based on an earlier route from Cruachain, Roscommon, the seat of the Kings of Connacht to Croagh Patrick, which itself is a site of ancient ritual activity. 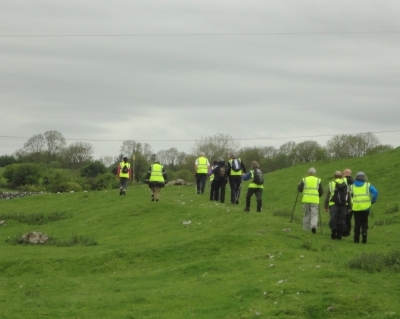 The group setting off on the Tóchar, walking across the fields adjacent to the abbey. The route meanders through the landscape, as we move in meadows, walk along ridges and navigate boggy areas. The removal from the everyday is most definitely expressed in the cross-country sections where soft paths carry us away from the world through quiet patches of nature. Even the on-road sections can be very sedate with little traffic coming by. This withdrawing from the rest of the world and our own lives is a central part of pilgrimage. The landscape itself, is central to the creation of this liminality. 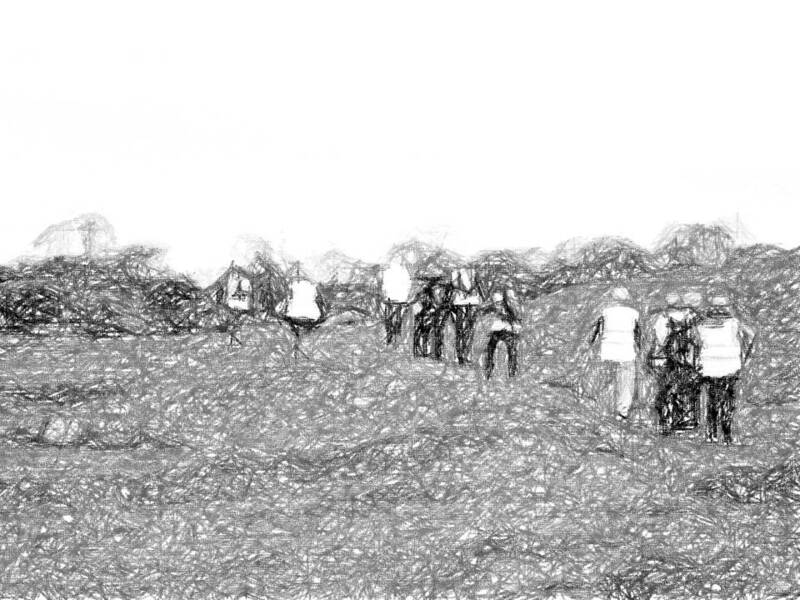 Walking through one of the many fields the Tóchar passes through, the group spreading out as people chat and walk. 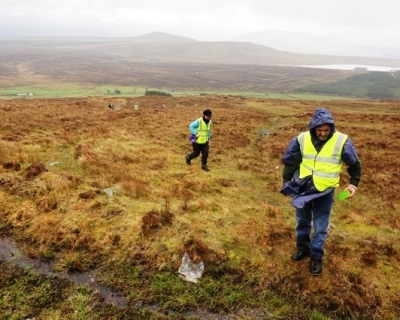 The Tóchar follows is known route as much as possible which involves walking on road and through countryside. However, many of the roads are very quiet boreens on which you encounter little, if any, traffic. Gathering for mass on Boheh stone (St Patrick’s Chair) a former mass rock with ‘cup and ring’ motifs which are a fine example of neolithic rock art. 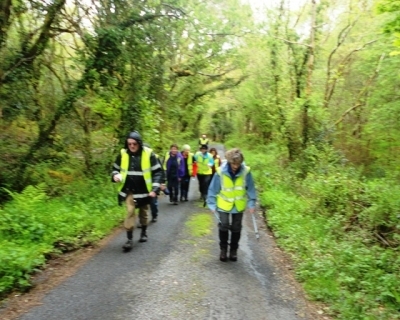 On the long stretches of road in Teevenacroaghy the group is very spread out. It is in the latter part of the day, as we approach Croagh Patrick. Only a few climb to the actual summit of Croagh Patrick, as it is an extra undertaking: it is explained to us that the main part of the pilgrimage is the route itself, in doing this you have completed the pilgrimage. This speaks to an ideal of pilgrimage as a journey, rather than a destination. The typical outlook would see the summit of the Reek as a requirement, but in this event our attention is called to other ways of walking and being. It is a readjustment, a pleasant one. 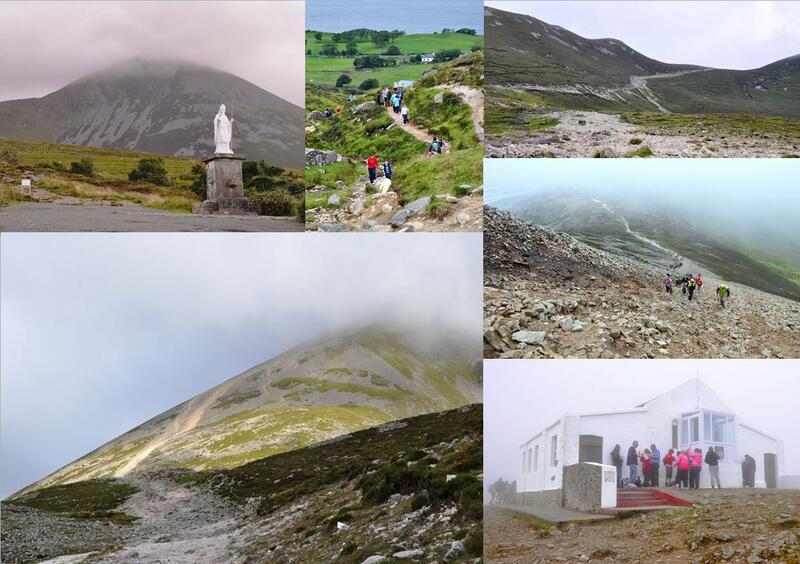 Beginning the climb of the Croagh Patrick ridge form the northern, Teevenacroaghy, side. The path is less clear here, as we walk across rough ground. 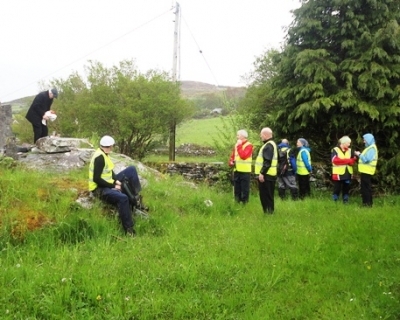 As the bus takes our group from Murrisk back to Ballintubber, we chat and rest. We say our goodbyes and each of us, in our previous groupings or as individuals, go on our own paths. “Reminding yourself that life is a journey not a destination, you now let slow motion time drift past on diaphanous wings while you absorb the timeless sensations and colours of the Mayo countryside.” John O’Dwyer, Pilgrim Trail, The Irish Times, Jul 14, 2012. 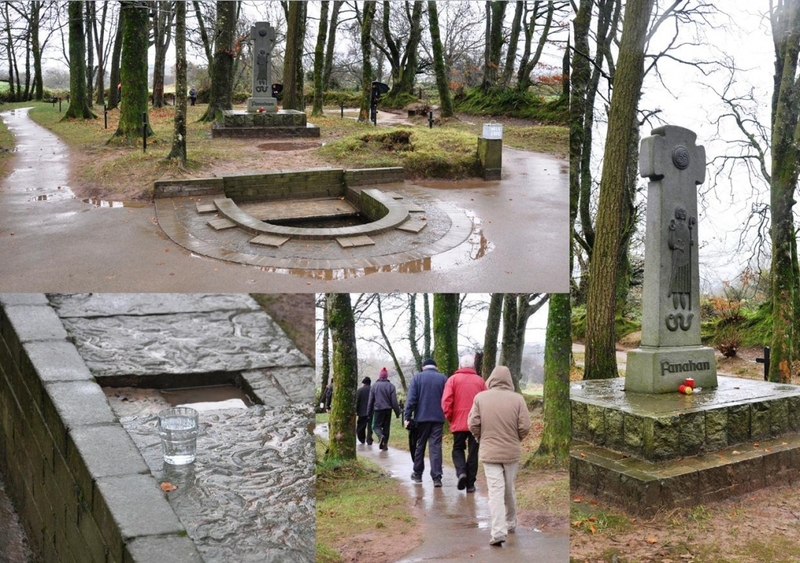 Tóchar Phádraig: a Pilgrim’s Progress. 1989, Ballintubber Abbey Publication, Mayo. Groningen in the north-east of the Netherlands is a biking city. While cycling is an extremely common in the country, the shear dominance of bikes and cycling in this city is noteworthy. I was in the city for the Fourth International Emotional Geographies Conference and we were all struck by the role of bikes in daily life. Indeed, we were informed that there were 2.4 bikes per head of population in the city. It was both fascinating and inspiring to see what a city can be like when bikes become the prevalent form of transport instead of cars. As a pedestrian it took a little getting used to, bikes whizzing by, people of all ages and backgrounds pedalling and stationary bikes occupying considerable space. I found myself having to get good at estimate how gaps between cyclists for crossing the ‘roads’. I resisted to urge to rent a bike myself, instead deciding to explore the place at my walking pace. It’s nice to think that cities can be like this, but also unfortunate the it is unlikely that such a culture would ever come to be in Ireland. 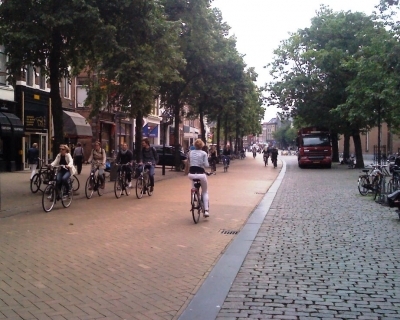 Although most of our cities are small enough to be cycling cities, it would require a large scale shift in thinking and considerable official support in terms of infrastructure, not least large investments in biking parking spaces and proper bike lanes – completely separate to the main road by reducing car lanes or making streets one way. While any such changes are a while off we always have Groningen! A bike lane to one of the main squares Vismarkt. Although these lanes are occasionally used by cars, it is dominated by the flow of thousands of bikes daily. ES: Una ciclovía a una de las principales plazas de Vismarkt. Aunque estas vías son usadas por autos ocasionalmente, están dominadas diariamente por el flujo de bicicletas. 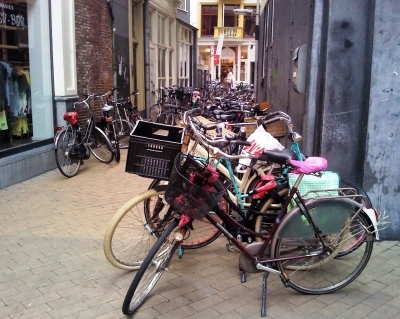 Bikes packed into a laneway off Grote Markt. Bikes are parked every where here, there are marked out areas on all footpaths and public buildings (such as the University and Train Station) have the facilities to park hundreds of bikes. ES: Bicicletas amontonadas en una vía adyacente al Grote Markt. Las bicicletas están estacionadas en todas partes en este lugar, hay áreas demarcadas en todas las aceras y edificios públicos (como la Universidad y la Estación de Tren) tienen instalaciones para estacionar cientos de bicicletas. A short video taken on my phone showing the dominant bike culture by capturing the flows and interactions at a junction on the Grote Markt. ES: Un video corto filmado con mi teléfono mostrando el dominio de la cultura ciclista, capturando los flujos e interacciones en un cruce en Grote Markt. Groninga, al noreste de los Países Bajos, es una ciudad en bicicleta. Si bien andar en bicicleta es bastante común en el país, la prevalencia de las bicicletas y el ciclismo en esta ciudad son notables. Estuve en la ciudad para la Cuarta Conferencia Internacional de Geografías Emocionales y todos nos sorprendimos por el rol de las bicicletas en la vida diaria de las personas. De hecho, nos informaron que hay 2.4 bicicletas por persona en la ciudad. Fue facinante e inspirador ver cómo puede ser una ciudad cuando las bicicletas se convierten en la forma principal de transporte en vez de los autos. Como peatón acostumbrarse toma tiempo a las bicicletas pasando raudas a nuestro lado, gente de todas las edades y status pedaleando, y también tantas bicicletas estacionadas ocupando espacios considerables. Me encontré a mi mismo mejorando mi habilidad de estimar los espacios entre bicicletas para poder cruzar las “calles”. Resistí la tentación de alquilar una bicicleta, y decidí explorar el lugar a mi propio ritmo. Es lindo pensar que las ciudades pueden ser así, desafortunadamente es poco probable que esta cultura se instale en Irlanda. A pesar de que la mayoría de nuestras ciudades son lo suficientemente pequeñas para ser ciudades en bicicleta, requeriría un gran cambio en nuestra forma de pensar y considerable apoyo del gobierno en términos de infraestructura, por lo menos grandes inversiones en espacios para estacionar las bicicletas y ciclovías apropiadas – completamente separadas de las calles principales o haciéndolas calles de un sólo sentido. Si bien estos cambios aún tomen un poco de tiempo, siempre tendremos a Groninga!